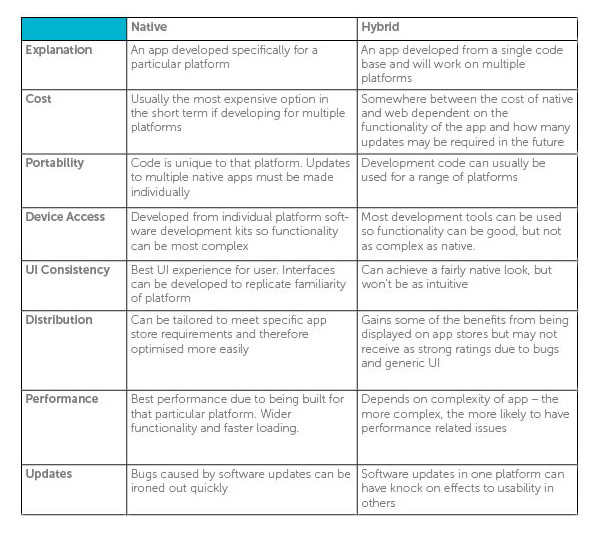 Recently we were asked by a client what the difference between a native, a hybrid and a web apps is, and whether it really matters which you choose. Our preference : We always develop and recommend an app that provides the best user experience which is why we are largely a native app development agency in Bahrain. Before approaching any app development agency with your new business idea related to Mobile Apps, it is important to do your research and understand the different methods of development. Although we are a native app agency, we do also develop hybrid apps when it is clearly the best option for our client. A native app is one which is developed for one specific platform. So the app is developed for iOS and separately for Android e.g. Angry Birds. This usually provides the most enjoyable experience for users. If you need any more information regarding an app development project we can provide help and support. Call us to for a free consultation or pass by our office in Seef District, Mamana Bahrain, to discuss your requirements for Native / Hybrid or Web Apps.